The Stables is a light and airy converted long barn with panoramic views over the Irish Sea from the living room and master bedroom. It has it’s own track to the north of the site giving it privacy from the other farm buildings and making it safe for kids to play. The cottage is very cosy in the winter with two wood burners and under floor heating and a great place to eat outdoors in the summer with a south facing conservatory and pergola. The sunsets over the sea in the summer are fabulous. Bedroom 1 has king size double bed and en-suite bathroom, bedroom 2 has queen sized double bed. The children’s bedroom has a bunk and a single. There are two bathrooms. The en-suite has shower, bath and under floor heating and the other has shower only. The kitchen is newly equipped with Smeg range gas cooker and electric oven. There is a large fridge and freezer, washing machine and dishwasher. The work surfaces are Oak and slate. The Coach House faces south and is part of the main courtyard. It has views up towards the Preselis and has a sheltered sitting out area facing south. It has a large open living dinning space with a cosy sitting area around a wood-burning stove. The walls are whitewashed and the floor is reclaimed terracotta brick with under floor heating. The Kitchen is well equipped with Basalt work surface and Smeg stove and there is a utility room with washing machine and drying area. Upstairs has a large double bedroom with small ensuite bathroom and a tiny single bedroom leading out onto a south facing terrace. The main bathroom is downstairs bathroom with shower and bath. Please be aware that the stairs are loft style and may not be appropriate for the less mobile. 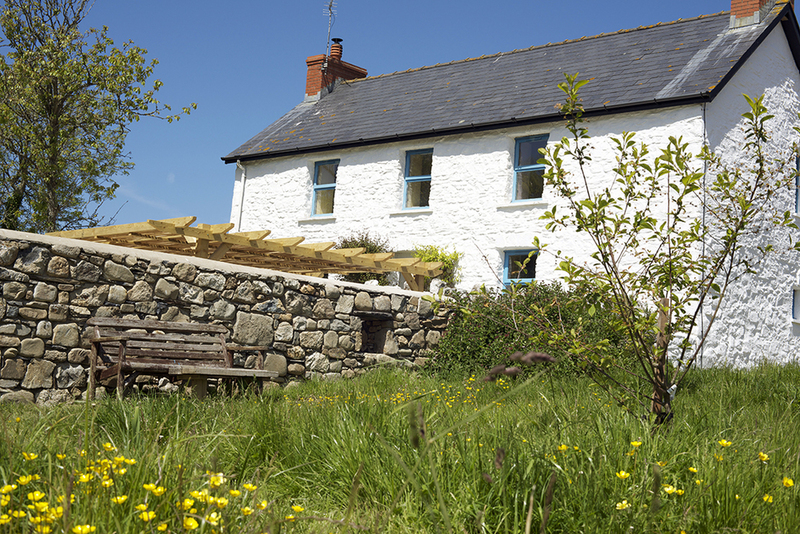 The Coach House is a perfect location for walkers keen to get explore the Pembrokeshire coastal path. The Farmhouse is the heart of the site and is a 5 bedroom cosy family house with large kitchen and dining table for ‘big eating’. There are 3 double bedrooms (one with en-suite) and two single bedrooms. It has it’s own walled garden, barbeque and pergola areas for outdoor eating. It is available for a limited number of weeks a year. It is ideal for a large family or two small groups. Larger groups may want to book The Stables and Coach House at the same time.